The Compact Weaver was formally described by George Ernest Shelley, an English geologist and ornithologist. Shelley had 2 specimens of the Compact Weaver. An adult female specimen was donated to Sharpe's collection by entomologist William Wilson Saunders, and this specimen is now in the British Museum. The second specimen was a non-breeding bird collected in Accra, by Shelley who visited Ghana from mid January to March 1872 to collect birds. 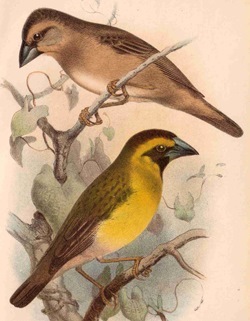 The first illustration of the Compact Weaver was published in Sharpe (1890) of the two type specimens, a non-breeding adult and a female. 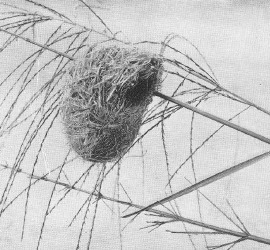 The next illustration relating to this species was a photo of its nest published in Chapin (1917). The breeding male was first illustrated by Bannerman (1949). Hyphantornis superciliosus	Shelley 1873,	Ibis, p.140	Accra, Gold Coast. superciliosus, Latin: superciliosus, eyebrowed (refers to eyebrow of breeding female). W Wilson Saunders and George Ernest Shelley. There is a type specimen in the British Museum (BM 1877.7.11.227).